5. John Masefield (1878-1967). The Faithful. London: Heinemann, 1915. Portrait of John Masefield by William Strang, 1912 ( ). 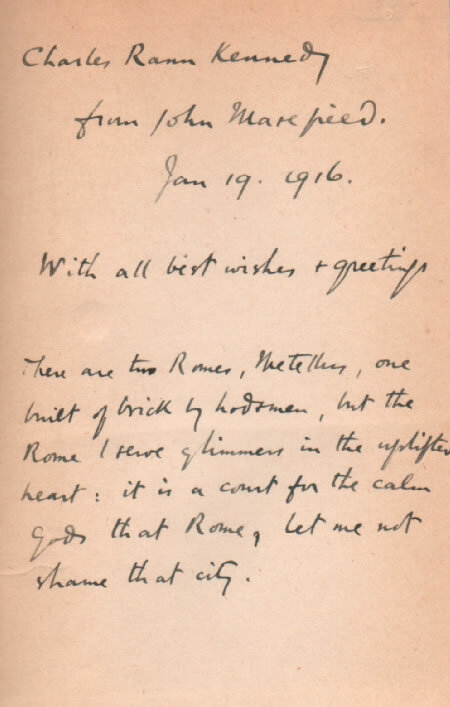 First American edition of The Faithful inscribed by Masefield to Anglo-American dramatist Charles Rann Kennedy (1871-1950), 19 January 1916. The future Poet Laureate’s long adaptation of the Chûshingura (Ap), largely in prose but with verse passages, some of which incorporate Japanese syllabic counts of five and seven, is discussed by Gatenby (A20), Nicoll (A21), Ennis (A22), Miner (A25), and Ernst (A45), but more telling are the comments of two reviewers of a 1919 New York production, both writing in the New Republic (vol. 20, pp. 326-27). Elizabeth Coatsworth begins by noting that the program for the evening informs that Masefield ‘has retained the original plot of the legend as it first came from the brain of the mysterious author who conceived it B.C. 1338’. After calling attention to the two millennia error Coatsfield adds that Masefield ‘makes matters worse by a generous injection of Western religion and motivation’ into the Japanese plot. She mentions a ‘Japanese gentleman in the next seat’, who ‘had been clucking disconsolately’ throughout the performance and who informed her at the end that ‘Mr. Masefield has mixed things together’, for ‘in Japan there are ten acts, but it is—moving’, while ‘this is only queer’. Coatsfield suggests that the ‘introduction of European customs such as hand-shaking and kissing might be forgiven’, but ‘it is [Masefield’s] lack of understanding of the psychology of his characters that strikes the discord’. F. H. follows Coatsfield’s review with a note that ‘it is sadly clear that The Faithful is pseudo-Japanese’. Like Coatsworth, F. H. ‘happened to be near some Japanese’ during the performance, who ‘in spite of their antique reticence . . . publicly made moan’. F. H. nonetheless recommends the play to those who are ‘ignorant, blissfully’, of its ‘historical support’, and notes that he ‘felt no responsibility for its Japaneseness’, but rather ‘took it as an other’, like a ‘legend from the mountains of the moon’. Gatenby notes that Masefield wrote to him that his sources were Mitford’s Tales (see D4), two translations of the Chûshingura, and information provided by Japanese students in London. 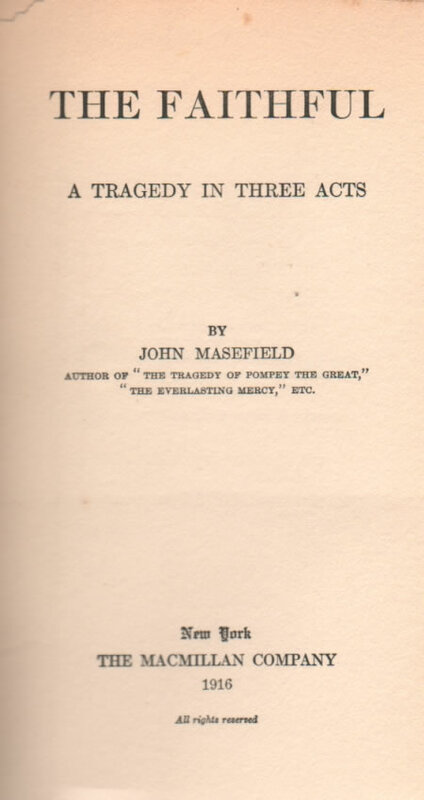 See D3 and D4 for notes about the translations to which Masefield almost certainly referred.